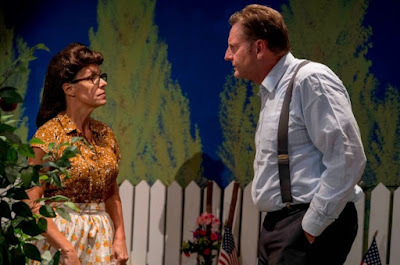 Carol's Theatre Reviews ~ It's Fun To Go Out: Miller’s “All My Son’s” Still Packs a Solid Punch. Miller’s “All My Son’s” Still Packs a Solid Punch. There’s something about watching the dynamics between Joe and Kate Keller, characters in Arthur Miller’s 1942 Tony Award winning play “All My Sons” that’s a bit off. In 1942 this country was at war. According to an article brought to Miller’s attention regarding faulty airplane parts, Miller penned “All My Sons” and put real faces and real consequences on amoral actions all done for the sake of the all- mighty buck. The domino effect was imminent death to those brave service men flying plane’s with faulty equipment. “All my sons” is a drama and a tragedy with humanitarian fallout that sent shockwaves throughout the world, the Keller family and their small, incubated neighborhood community. Joe Keller and his best friend, next-door neighbor and business partner Steve Deever, owned a manufacturing plant that was government contracted to manufacture and supply airplane parts to the US Army. At some point in time, when the aircraft engine cylinders were in high demand and the partners were under pressure to satisfy their government contract, defective parts (there were cracks in the cylinder heads) were among those shipped and placed into war aircraft. It just so happened that on that fateful day Joe, who had never been sick a day in his life, or for that matter, missed a days work called in sick. When Steve called Joe at home to see what he should do, Joe told him to ship the engines, flaws and all. It was later discovered that because of the defective parts twenty-seven planes went down killing all aboard. Both men were arrested and accused of selling faulty parts. Joe managed an appeal claiming that he never spoke with Steve and that Steve acted on his own. Joe was set free leaving Steve to serve out the jail sentence. Both Steve’s children, son George and daughter Ann, close neighbors of the Keller’s, disowned their father. But things were about to change as we pick up the story three and a half years later 1947, in Joe’s sprawling backyard (Skyler Hill and a dozen or so helpers with construction) where both Ann, whom we learn is planning on marrying Chris, (she was Larry’s fiancée) and George who has broken his vow of silence with his father (he is now a NY attorney) stand face to face with the past, present and future. Chris is now in the family business but carries that guilt with him always. Kate, Joe’s wife still believes that Larry is alive and won’t even acknowledge that he might have died. Every one tiptoes around her so as not to upset the applecart. Kate knows that if she admits Larry’s death, she is in essence acknowledging Joe’s guilt in the matter. Had Miller been alive today, he might have picked up on the scandal surrounding the automobile industry and the defective work some companies shoved under the rug and pretending not to notice. Cars with defective airbags were on the road and consumers were dying as a result of the flaws. Years after the fact the Feds finally got around to holding hearings and recalls. Miller’s 1947 play ran for only 328 performances but still managed to win the Tony Award for Best Author and Best Director of a Play. His criticism of the American Dream, that caused the downfall of Keller and the destruction of his family lies at the heart of “All My Sons”. It was the main reason Miller was called before the House Committee on Un American Activities in the 50’s. He was called out for his left leaning thinking and critique of greed and mendacity. What the powers that be failed to notice was the enormous tragedy that lay just beneath that struggle for the American way of life. Till this day “All My Sons” still packs a powerful punch. Now playing through Oct. 24th at OnSatge Playhouse in Chula Vista, director James P. Darvas and his somewhat uneven cast managed to hush the audience (on the night I arrended) when, Joe, confronted with the powerful and unrelenting truth of it all from George, Chris and Ann, admits that ‘they were all his sons’, my eyes welled up and I had all I could do stop my self from bawling. 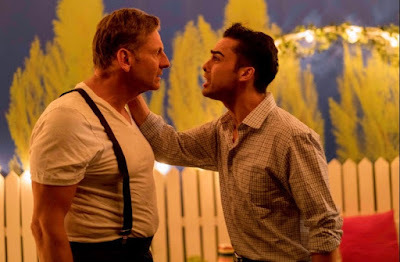 Aaron Lugo is the goodness and blind innocence of son Chris who wants to believe with his entire being that his father is innocent of any wrongdoing. At one end of the truth and reality spectrum, he’s ready to move on with his life and settle down with Ann in spite of the fact that both parents object, for different reasons. Lugo’s Chris grew on me as his character gained a backbone and showed some genuine heart, genuine remorse with a sincere understanding grasp of his part in this family dynamic. Emily Candia is spunky as Ann Deever. It looked like she stepped right out of a 1940’s (Pam Stampoly-Ericson) bandbox. More than anything she doesn’t hold back on feelings as she subtly reasons from just happy to be back in the fold to knowing that that is the farthest thing from her reality. Mark Anthony Flynn's George hesitatingly steps into the Keller backyard, troubled and uncomfortable to be there. Expecting to find his sister Ann and take her away with him, he does an about face and softens when he sees Kate, but it’s not enough to convince him that Joe Keller didn’t ruin his family. Allison Macdonald plays Kate with all the pent up emotions only a mother can understand, on the one hand and a concerned wife who knows her husband all too well on the other. When she cautions Joe: “Be smart, Joe, be smart” you know how complicated Ann is and that something is amiss in her oft times demanding and stubborn way. Back to that dynamic: what Joe did that many years ago, is always hanging in the balance of every move they make and ever word that speak. Joe, played with mocking bravado and undaunted reality to accepting responsibility by Mark Solz runs the gamut of emotion from ‘man on top of the world’ to finally getting that the boys that were killed by his decision to let the order go were not just about his sons (‘that he did it for his sons, to have a better life) but that they were ‘all his sons”. That is the passion and the truth of Miller. 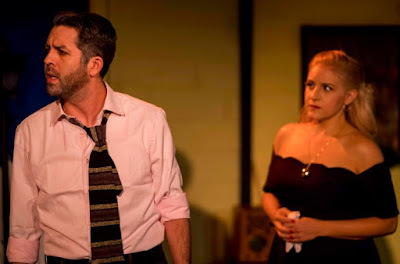 Lesser characters, Dr. Jim Bayliss (Devon Wade) and his feisty wife Sue (played with too much anger and not enough subtly) by Jess Boles Lohmann, drop in and out of the Keller’s back yard as the drama of the Keller family percolates. They bought the Deever’s house and she, aware of the details of that night, evidently feels she has a right to push everyone around. Dale Goodman’s lighting design is perfect and Pam Stompoly-Ericon’s hair designs come right out of the 40’s playbook framing the time. 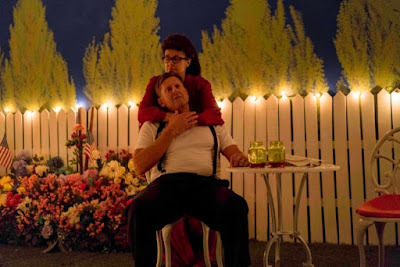 “All My Sons” is still one of my all time Miller plays. Had the cast slowed down a bit in their delivery and their diction been more exact, this would have improved the overall satisfaction of a difficult play to mount. I will never understand the savagery of war that makes us all victims and perpetrators at once. Hats off to OnStage and Darvas for venturing into deep waters where no one comes out a winner and everyone is a loser.